No matter what you may think of Kevin Strange or his writing style the guy is doing exactly what he wants without any care or concern for the mainstream and you know what? 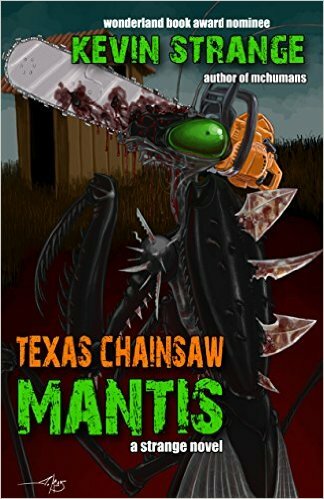 Thank God for Kevin because I think Mantis may in fact be the very first splatter/bizarro/insect novel. It seems like the craziest idea, and I couldn't even imagine the time he spent researching the praying mantis. That is true dedication to the craft. You have elements here that take from so many influences and styles that even the most jaded horror fan will actually devour this book. If this didn't feature a praying mantis I bet more people would actually read this. It isn't the kind of story that most horror or even bizarro fans would touch, but you should. Kevin plays this straight and gives his title character human characteristics. We know someone like Matthew. He's the guy that no one notices. The check out clerk at our favorite gas station, that weird waiter at that place we eat lunch everyday. On top of that he has a unique writing style that makes you forget that you're reading about bugs and you become sucked into the crazy story that actually features a world that has been taken over by praying mantises. At its heart is Matthew and his quest for vengeance. The key to all of this is greed. It trickles from the humans right to the mantis' themselves. This isn't by any means a light fluffy book. This is dark and brutal and I have to admit that it's without a doubt one of my favorite books..